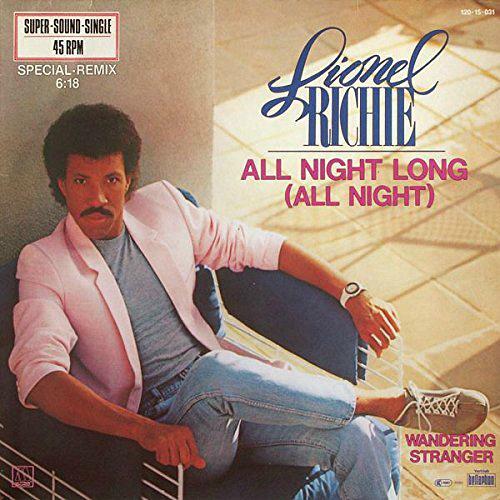 This single was the first to be lifted from Lionel Richie's second solo album Can't Slow Down and topped the Billboard Hot 100 in America. The song also reached #2 in the UK for four weeks. Originally released in August 1983, the song features much of the smooth soul style of his band The Commodores, but with an extra caribbean-style dance groove which proved popular with the record-buying public. Richie performed this song at the closing ceremony of the L.A. Olympic Games in 1984. Now, here's a fact you may not know. The African style lyrics that feature in the song are not actually African at all. They are, in fact, mumbo jumbo that was created by Richie as he couldn't find the time to hire a translator! A new version of "All Night Long" was recorded in 2011 as a duet with the Australian singer/songwriter Guy Sebastian, with proceeds going to the Queensland Floods and New Zealand Earthquake Appeal. During the 80s, the singer/songwriter enjoyed success with thirteen top ten hits in the U.S. (including five chart toppers) and nine top ten hits in the British singles chart. The video was directed by ex-Monkee Michael Nesmith and directed by The Monkees founder Bob Rafelson. In it, we see Richie walking through studio-based streets filled with people wearing colourful attire. He is then joined by a large group of dancers, and adults and children in the streets and on balconies also start dancing, along with the cops. Basically, the video quickly turns into one big street party. The single entered the UK singles chart at #56 in 25th Sept 1983 and took just a month to reach #2 on 23rd Oct 1981, being held off the top by "Karma Chameleon" by Culture Club in the first week. For the next three weeks, the single was kept off the No.1 position by Billy Joel with "Uptown Girl", which must have been incredibly annoying for Mr. Richie.